In October 2017 I turned 37. It came as a little bit of a shock as I still think I’m in my 20’s. 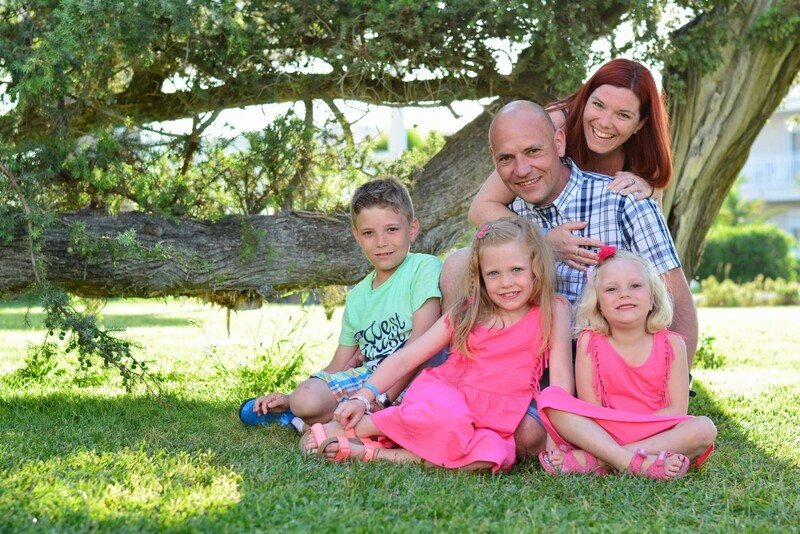 I’m not even sure I feel like an appropriate adult the majority of the time but somehow I’ve found myself a parent of 3 children, a small business owner and navigating my way through life with Daddy Moo (who I’ve spent nearly half my life with now!). This paragraph has me aging by the second! Oh and now I’m 38! You can follow my journey as I attempt to eat eels, possibly make a Christmas Album and generally do some random things. 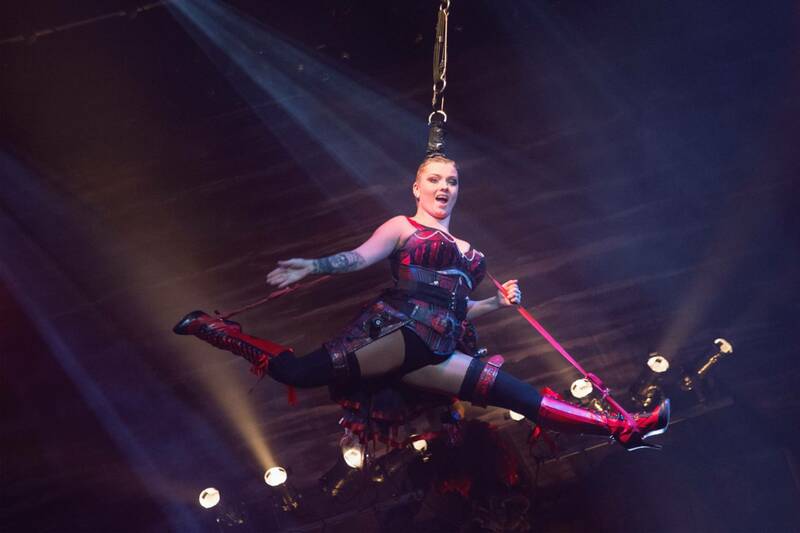 I realised lately my #40before40 could get me a spot on the cast of The Circus of Horrors maybe I should add become a circus performer to my list!! Courtesy of Lighthouse Poole, we have seen the show every January for 5 years and it just gets better year on year. Anastasia with her Guinness World Record Breaking (#40before40 number 2) hair, this girl is flying through the air via her hair! No really. I’m not sure if that’s the kind of record I’ll be looking to break. Whilst Vittali isn’t the World Strongest Man (#40before40 number 34) he is pretty amazing as a traditional strongman circus act. As a mother of 3 I’m pretty inept at juggling armfuls of bags, lunch boxes, stray jumpers (food shopping as I’m too tight to pay 5p and too disorganised to bring bags) but Vittali lay a plank of wood across the back of his neck with a man laying on top of that with his hands round his neck. On each end of the plank a swing which a grown man is sat on, swinging!! And he was still able to walk around! Impressive! Makes my school run ensemble seem pathetic. Then let’s not forget Carmen, who not only throws knives at Vittali but she shoots arrows at him. 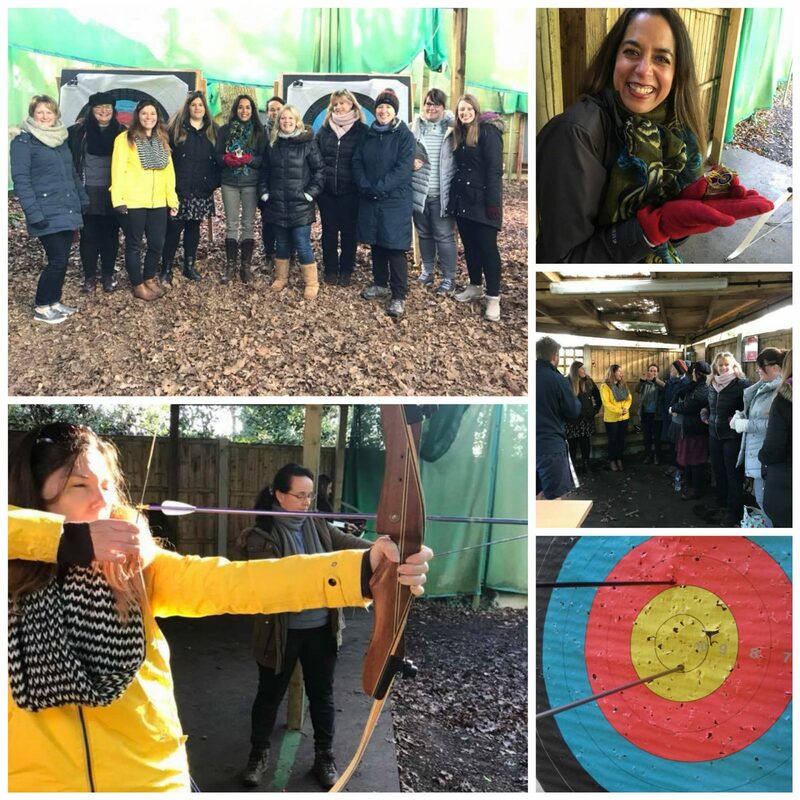 During my Self-employed Team Building Socials we’ve been having fun learning archery skills (#40before40 number 32) although I probably won’t show up in fishnets and a basque but who knows I might find my niche as a circus act! 1. Climb a mountain : 13th August 2018 This has to be one of the craziest experiences I’ve ever had. We (Daddy Moo, Charlie and I) drove to North Wales on the Sunday after checking in and finding somewhere to park the car as the Pen-Y-Pass car park is £10 every 12 hours something to be aware of beforehand, we were not prepared for this! After we ate a picnic style tea, whilst watching Mr Bean on Netflix and headed for an early night. 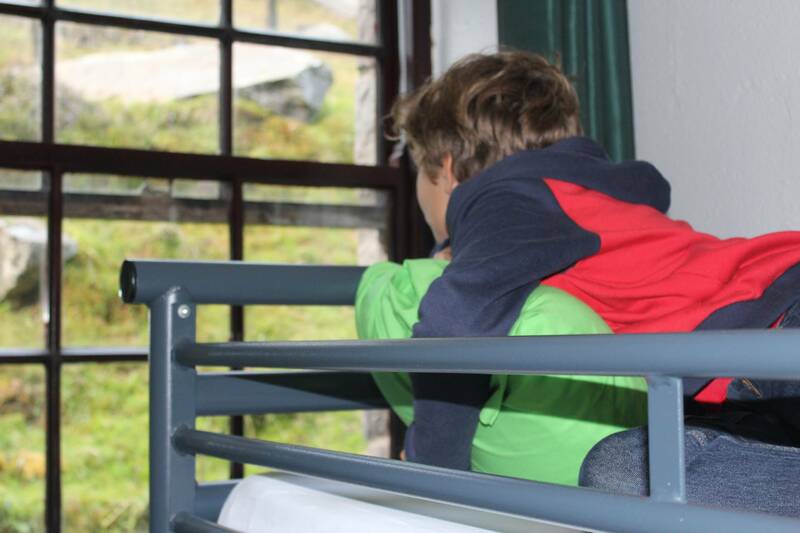 We stayed at YHA Snowdon Pen-Y-Pass Hostel who kindly gifted us a family room accommodation, Charlie loved the bed which was a double bottom bunk with a single above us we also had our own en suite bathroom. I’ve never stayed in a hostel before there were so many great points, like the drying room which we needed! and the games room complete with Twister, Scrabble and a pool table. We woke up, were up dressed, backpacks filled and drinking a coffee contemplating our mountain climb by 8am. The fog was thick and damp, there was no sight of Snowdon anywhere! The carpark was already filling up fast with excited mountaineers so we decided to set our Strava and go for it. We had already planned ahead that we were going to walk up the Pyg Track and down the Miners which seems to be standard at Pen-Y-Pass as both tracks finished in this carpark, we’d spent some time the evening before looking at the maps and watching people coming down the tracks. 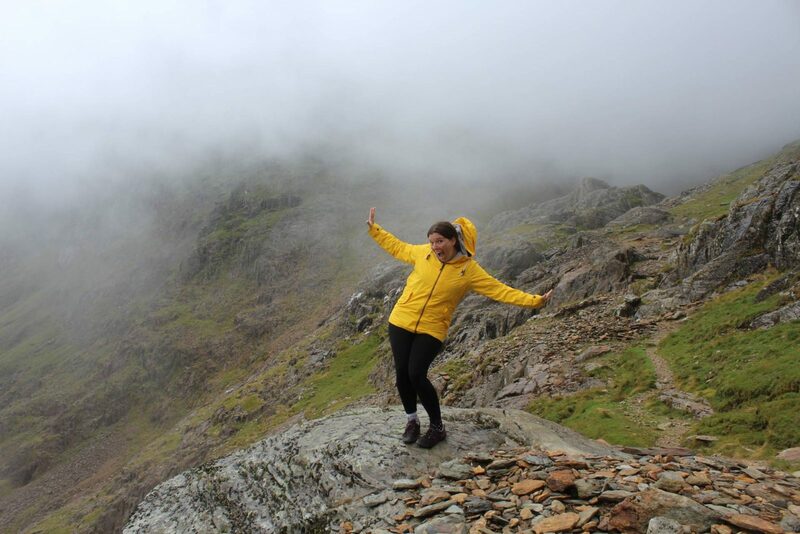 The weather was insane, wind, rain and mist we were soaked through and yet I couldn’t stop smiling. There were a few hairy moments and parts of the track that you were literally scrabbling up across rocks. Charlie was an absolute trooper, he didn’t complain once, keeping me going and instead choosing to savour every moment of our adventure. As the conditions were so bad we made the decision early on to just keep on moving and reach the summit as soon as we physically could. It took us 2 hours and 44 minutes but we finally reached our goal. After a little family group hug celebration we climbed the 10 or so steps to the actual summit and hung onto the brass plate on the trig point. The wind was intense I was sure I was going to blow off the top and I daren’t get out my DSLR so we had to make do with some blurry phone pictures. During our climb we had met our Army Cadet friends over and over who were excited to see their “mountain friends” at the Summit Visitor Centre. The fact we could change our soaking clothes for the dry ones in our backpack and grab a coffee to warm up was much needed. 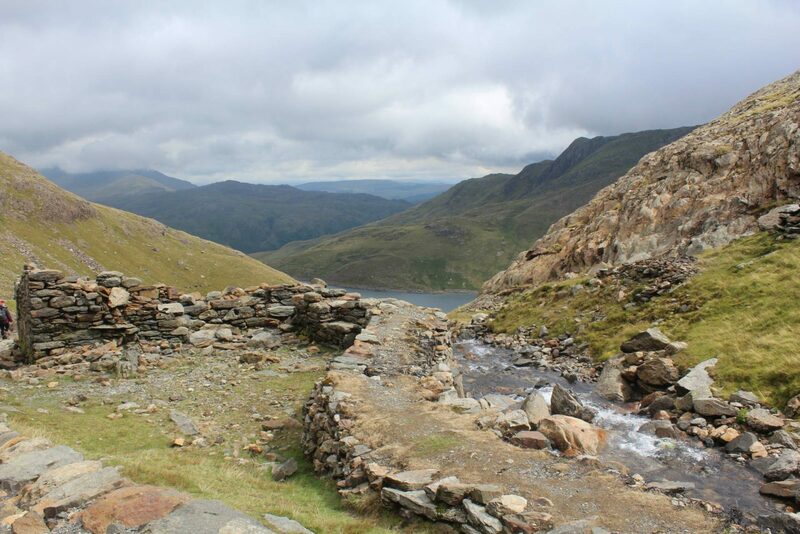 We also ate our picnic and after an hour decided to brave the weather outside and make our way back to Pen-Y-Pass. The wind was still howling but the rain had subsided by the time we descended the zigzag (of doom) and reached the marker where the paths split off into the Pyg Track and Miners. We sat and took in the views with our Army Cadet friends. The Miners Track has some phenomenal views (although the peak of Snowdon stayed hidden behind a cloud so I’ve still not seen it!) and meanders around the lakes. Charlie and I binged watched Merlin on Netflix over the winter so we’re super excited to see Llyn Llydaw, a lake below the mountain where legend has it at King Arthur’s death Bedwyr (Bedivere) threw Excalibur into the lake where it was caught by the Lady of the Lake. We didn’t see Excalibur or the Lady of the Lake but we did spot a lady having a swim. The sun shone and we felt amazing, of all the challenges I have undertaken this so far has been my favourite. After a nap, shower, delicious pizza, a glass of wine and a game of cards in the Mallory, surrounded by maps and tales of Sir Edmund Hillary we discussed our next mountaineering adventure. 2. Break a Guinness World Record : This was a goal for 2017 but I ran out of time need to take ACTION (my word of the year 2018)! Stop talking start doing! Charlie and I did research a LOT of records in 2017 so we have an idea which we could try and break, like the number of pencils snapped in half in 1 minute NOT run multiple marathons over multiple days in various countries! Attempt One : April 15th 2018 the largest seated exercise class. 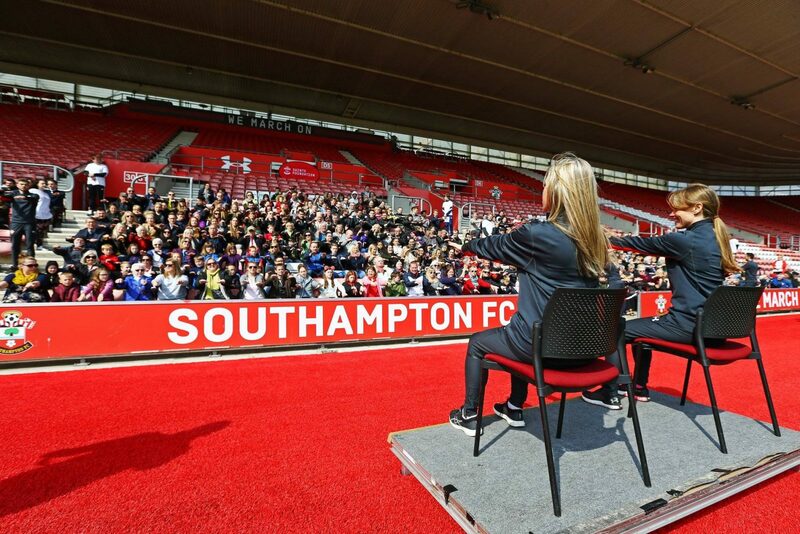 The children and I went to Southampton FC and spent a fun-filled half an hour exercising whilst seated in the stands. The previous record was 731 people which was set in Hong Kong in 2016 sadly this attempt was a fail, BUT we did have a great time and I’m thinking group events are a good way to try and ✔️ this one off! *UPDATE* July 17th 2018 completed another unit and am just 30 points short of a degree! 4. Go to America : Not fussy where …..
5. Write a second book : My first book “Crafting a Successful Small Business” was published in 2012! Come on Joanne how hard can this be! I’m so over thinking it, making it completely it a massive deal now as well it’s taken 5 years and I’ve still not produced one! 9. 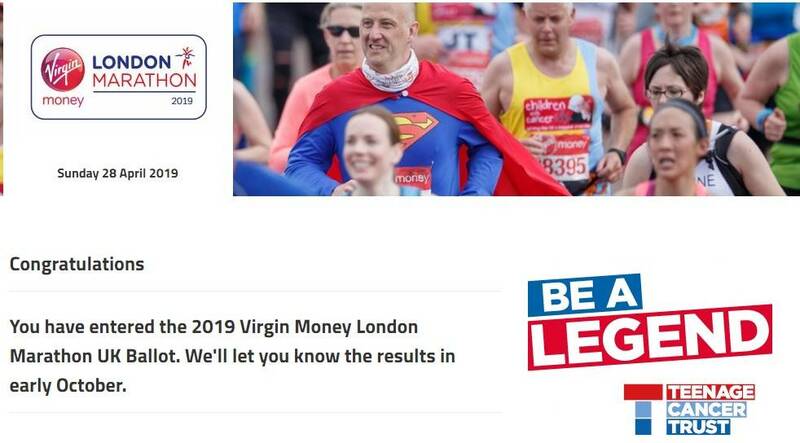 Enter the London Marathon : 30th April 2018 this specifically says enter the London Marathon. There is no mention of actually running it! Anyway task achieved. So watch this space. (OMG what have I done!) This week (October 2018) the ballot entries are being drip feed through the country and I haven’t heard a sausage (yet) which has started to get me a little worried. OK I’m seriously anxious! I’m not sure I could bear to run for hours and hours! But then the other part of me is feeling excited about the opportunity and contemplating training. It’s a great way to get back into running regularly as I would have that end goal. Having something to run towards (sorry couldn’t resist) motivates me otherwise I sit at home doing nothing, thinking about running but not running! Garmin has some great fitness trackers too to help monitor my runs, heart beat and general wellness. There is also a free Garmin website where you can analyse your performance. View detailed metrics and track your progress over time and share this data with the ever-expanding online community. When we make ourselves accountable to others it’s so much easier to achieve those goals. Wonder what my ballot will be! 6th June 2018 I tried to give blood again, however it turned out that my iron levels were too low. It had been a crazy busy day, the weather was so hot, part of me thinks I might not have drank or eaten enough that day and part of me was completely frazzled! Low iron isn’t something new too me I suffered quite a bit when I was pregnant with Megan, the team gave me a super leaflet with tons of foods to help keep my iron levels up. I was really gutted more so that I have to wait 3 months before I can try again. I think this is a case of lack of self-care on my part. Second donation made 21st November 2018. 13. Turn on the Christmas Lights : I’ve always wanted to turn on the Christmas lights you know like they do on the X Factor …. send them back to their home town to turn the lights on to rapturous applause, ample knickers being thrown etc etc ! I emailed a few places in 2017 and again in 2018 but sadly it didn’t happen but there is always 2019! AND this is literally my last chance!! 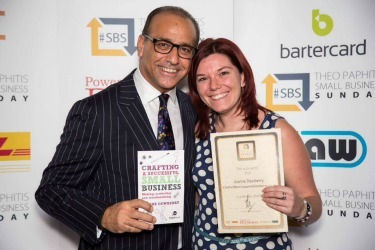 So if you are by any chance looking for a Amazon Bestseller, multi award-winning, quite a nice lady to come and turn on your businesses Christmas lights do get in touch. 14. 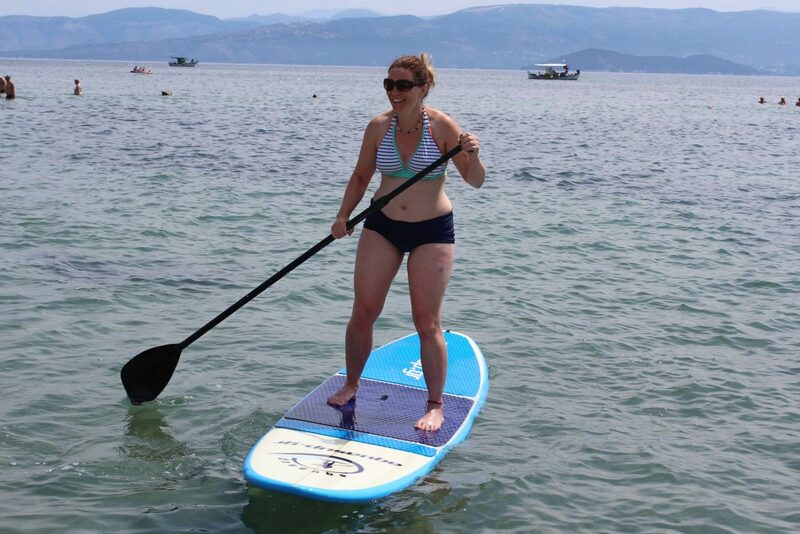 PaddleBoarding : 19th June 2018 Excuse the wobbly bits, big pants and extra large thighs and just look at that FACE  If you’re going to try your hand at paddleboarding then what better place to be than sun-drenched Corfu, gliding across the beautiful clear water to the cheering sounds of your children. We hired a paddleboard for 10 euros and everyone had a go, Megan turned out to be a bit of an expert, unlike Charlie who kept falling off! It seriously was just the tonic we needed and well yes I have been googling places to paddleboard in the UK, luckily I live on the south coast! I’m also putting paddleboard on my Christmas List! Any advice and tips welcomed I’m not usually a watersports person but paddleboarding is such a tranquil activity, I felt at ease and such calm, I’m hooked! 15. See a Band with Megan : 26th January 2019 I’m giving myself half for this as I wasn’t with Megan (#sorrynotsorry) BUT what I thought would be sitting and watching a show with my mum at Lighthouse Poole turned into a party with 1000 other screaming fans! Can it really be 37 years since George Michael and Andrew Ridgeley formed one of the most enduring pop groups of the 80s? WHAM! sold more than 28 million records and I don’t care what anyone says it’s not Christmas unless you have heard WHAM! If like me you are an 80’s living legend 😉 then The Best of WHAM! Show NEEDS to be on your must see list. As a joke I bought myself a Choose Life T-shirt thinking I was like well y’know super cool. When we arrived literally EVERYONE was wearing or buying a t-shirt! 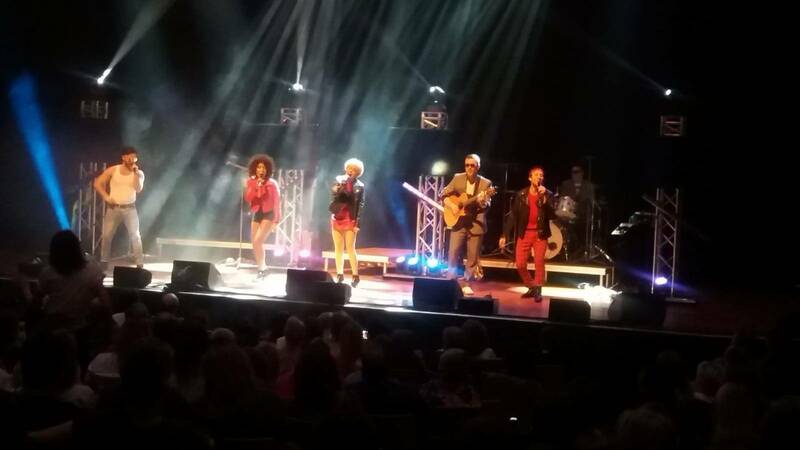 After the first song George, Andrew, Pepsi and Shirlie encouraged everyone to get up and dance, and dance they did. The concert hall of Lighthouse Poole has a sprung floor even if you can’t dance 1000 people bopping away you were flung into the air with glee! We sang and we danced along to the sensational vocals, choreography and an amazing live band. Gutted when the show ended, even more gutted when I watched mums videos back and realised that squealing in the background was me *see 19 & 28 does not bode well*. ‘Young Guns’ and ‘Club Tropicana’ are now my go to jam! Living the dream! 18. 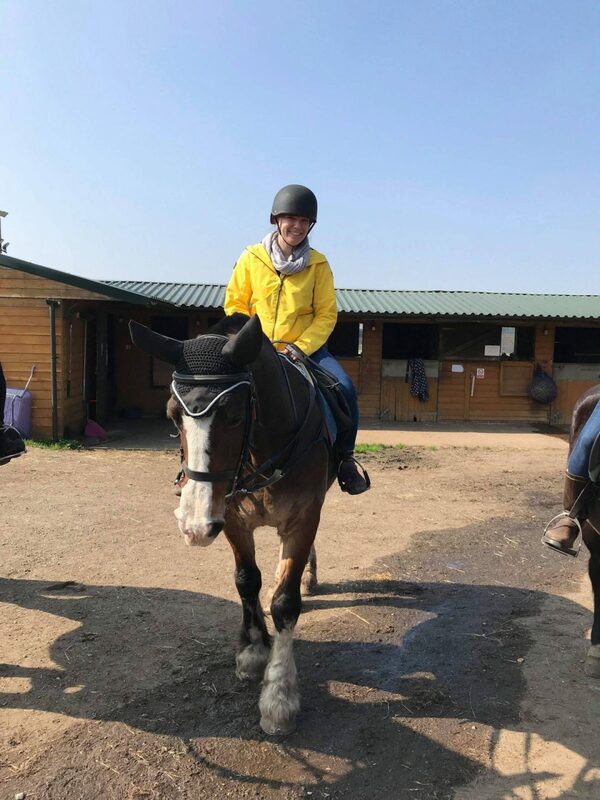 Ride a Horse : 29th March 2019 For the whole of 2016 every other weekend Olive rode a pony for 30 minutes/hour and she loved it. So adding ride a horse to my #40before40 list seemed like a piece of cake. 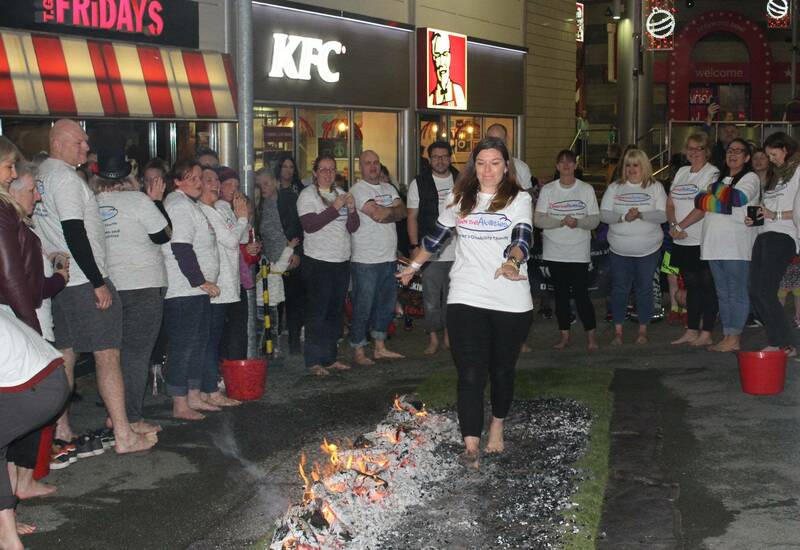 I soon discovered that Jo (from Jo’s Healing Cabin) had ride a horse on her #50before50 list we also completed our FireWalk together (November 2018 #38) together, having someone else with a list is really motivating! As these seem to go with my networking group it suddenly turned into a booked event of 5. I was excited and nervous all the way up until the horse, called Smartie, stood in front of me and I realised I had to ride it! 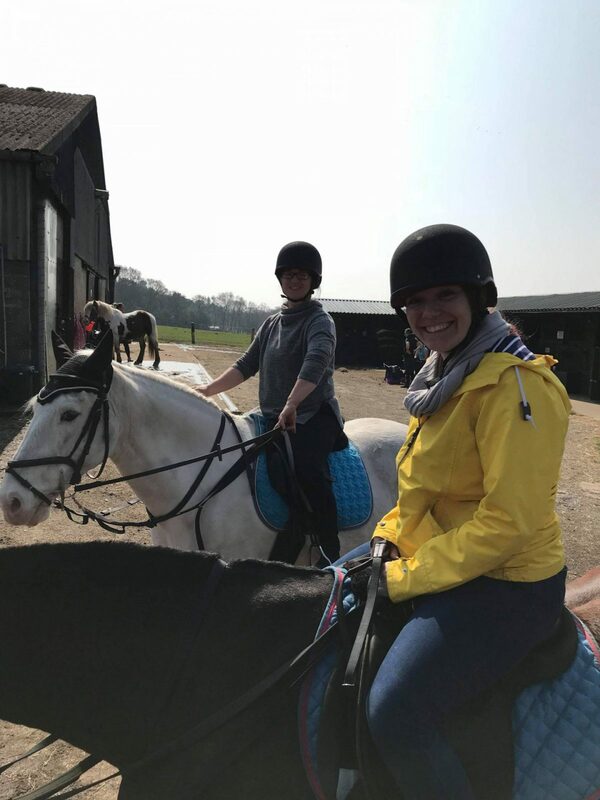 As soon as I’d managed to hoist my leg over and get comfortable in the saddle I knew horse riding wasn’t for me, he hadn’t even moved yet. 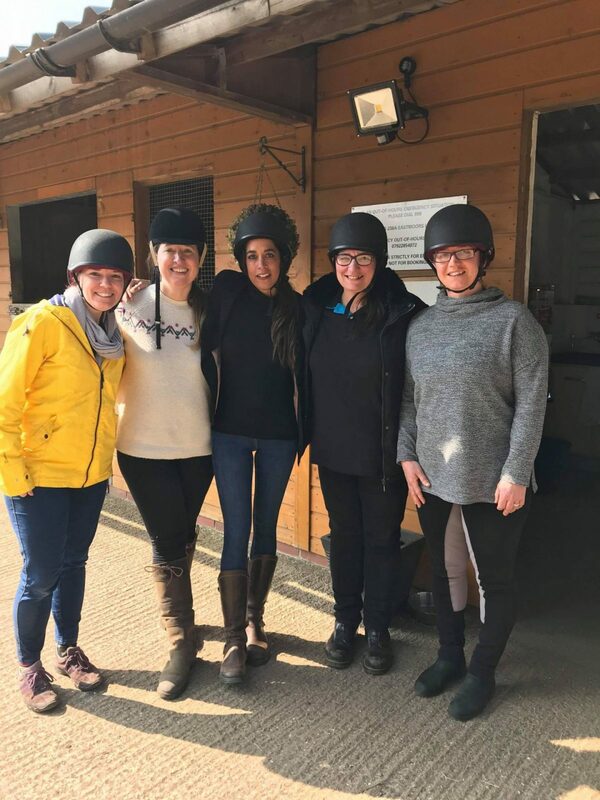 The team at Eastmoors Riding School and Livery were amazing, Katie stayed at the back with me, chatting away and making me giggle, offering advice on how to hold the reigns, sit properly and get the horse to do as I wanted. I attempted a trot, but cried and hated it! But hey at least I did it, I guess and it’s a massive tick on the #40before40 list ✔️ and I got to spend time with my lovely friends so all in all, it could have been worse. 19. Sing at an Open Mic ️ Night : 25th October 2018 we did a recky … well that’s what we are calling it after rocking up instrument-less and song-less! So singing at an open mic night takes preparation and planning. Who knew? So now I need to learn to sing a song and play an instrument  How hard can that be? 20. Go to Iceland : I think most people have the northern lights and swimming in a hot lagoon surrounded by snow on their bucket list. 21. Volunteer Work : I’m positive over the next 3 years I can spare a couple of hours and do something. If it involves fresh air too that would be a bonus. 24. Have an article published in a magazine : From 2013 until it’s demise I was an expert for Craftseller Magazine and appeared in most issues. It’s a little bit business related and a little bit ego boosting but I’d love to be published in a printed magazine, one my mum can buy at the shops. 25. Purchase 5 things I’ve never bought before : Screws, kumquat, goats milk, insect/grub filled lollipop and ***, yes crazy as it seems I’ve never bought these items before! This should be one of the easiest things to cross off my list! Kumquat (16th June 2018), not just a super cool word, but an actual fruit like a tiny orange, which it would seem they like a lot in Greece. During our stay in Corfu you could buy all manner of things kumquat flavour, alcohol, sweets, actual fruit, fizzy pop the list goes on. 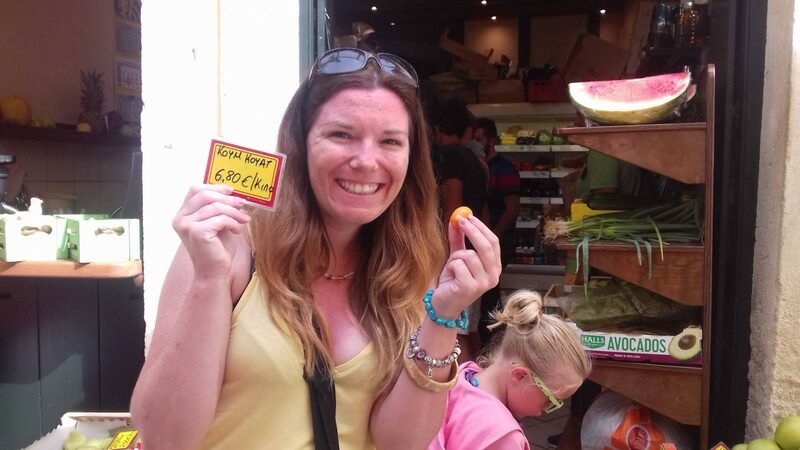 Although I did pose for this photo at a greengrocers in Corfu Town I actually opted to purchase a packet of kumquat sweets for Father’s Day …. they were like sugar coated jellies with a truly unique taste! Insect/grub filled lollipop (3rd October 2018), I purchased 4 lollipops, 2 mealworms and 2 ant filled varying flavours. The girls were really excited to try these (Charlie not at all! 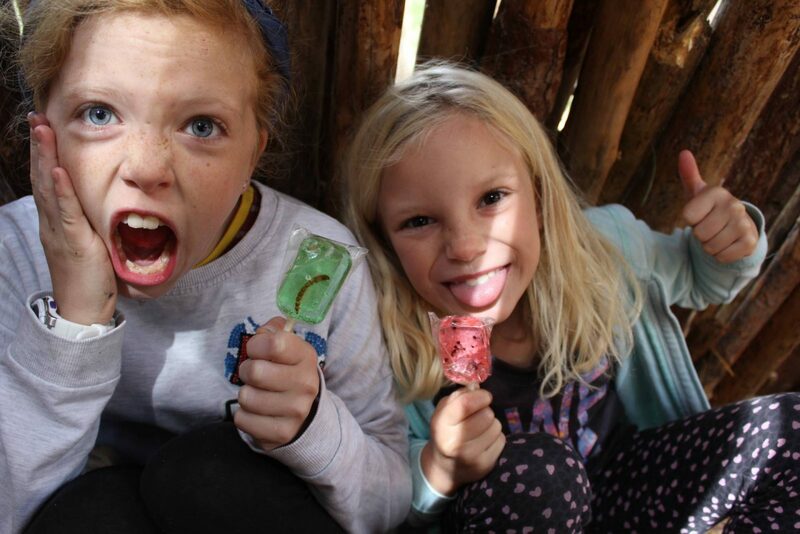 ), however it soon became apparent that Olive liked the idea of eating them but as soon as I unwrapped the watermelon flavoured ant lolly she wouldn’t even lick it! Megan opted for the apple flavoured mealworm and was enjoying it until she’d sucked away the thin layer of lolly over the mealworm and her exact words were “bits of worm are in my mouth” before she binned it! I ate part of the watermelon ant one but not enough to actually get to the ants. Now I’ve 2 lollipops to gift on! 28. Record Make a Christmas Album Single : Every Christmas, a whole host of celebs release an album of either old covers or Christmas songs *cough* Alexander Armstrong *cough*. Daddy Moo and I always have a little chuckle and brand them sell outs (sorry!) or maybe they are super shrewd on the whole passive income angle. Who knows BUT anyway I’m going to give it ago! I might include the children who knows! I would like to donate a percentage of the profits (if anyone buys one!) to charity too. OK so one year into my #40before40 and I realise on top of everything else making a Christmas Album is maybe a little ambitious so I’ve scaled down to “Christmas Single”. 29. 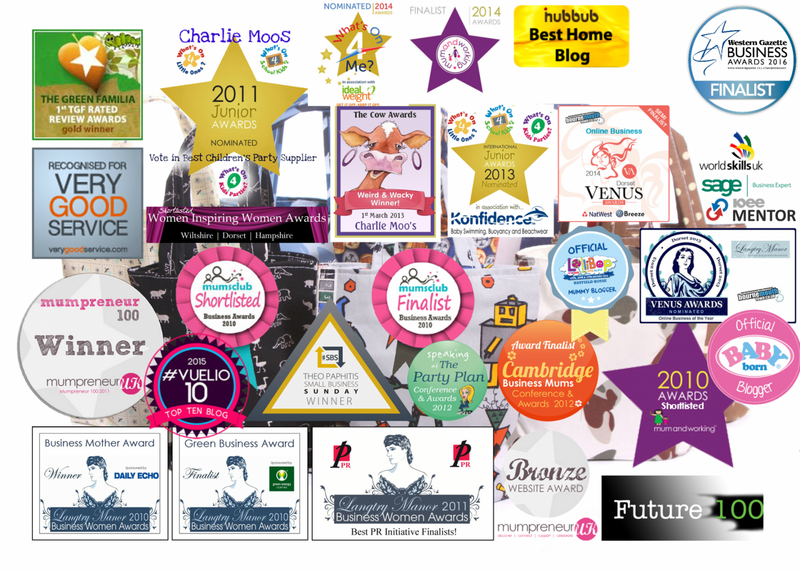 Win a Small Business or Blog Award : This might seem like an odd one as during my time in business I’ve won multiple awards but it’s actually been a few years. So I’d like to win one before I start to feel like I’m all washed up! 30. 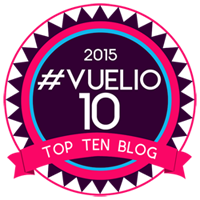 Write a third book : Hey I’ve written 2 now (see number 5 #40before40 hopefully!) I might as well add another to the list! 31. Twitter Blue Tick : So it would seem that Twitter is currently not accepting applications for Blue Twitter verification. *sad face* If this option becomes available before 2020 I will try but in the meantime I’ve a new 31. 31. Man VS Food Challenge : Who doesn’t love a food challenge? Charlie and I love watching Food Network together. Charlie enjoys baking and cooking just as much as he enjoys eating. We’ve joked for years about doing a man vs food style eating challenge. When I saw the Hungry Oven pizza challenge in Bournemouth I knew it was the one for us, because quite frankly we LOVE pizza. Also this year my birthday falls on Half Term making it a great family activity to start the 2 year count down to 40!! Both Charlie and I will try to eat 2.5kg 21” pizza EACH within 2 hours. I think Charlie has a better chance of completing than me! March 26th 2018 Hot Yoga another new skill I tried to master! 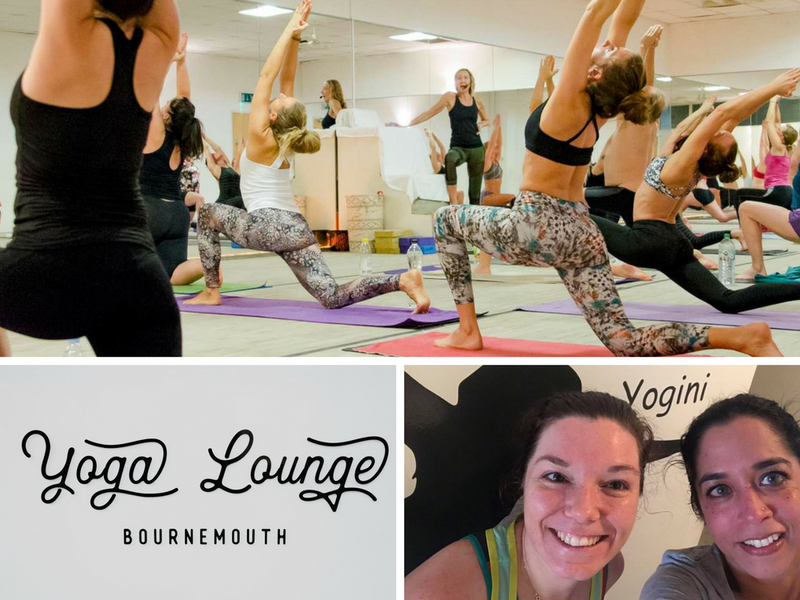 Illana (Hari Hari) and I ventured down to Yoga Lounge Bournemouth to try a spot of Fierce Grace Yoga. Totally overdressed and totally under prepared! Fierce Grace Yoga combines strength and flexibility for both body and mind. Lasting 90 minutes in temperature of 40 degrees! You certainly are sweating by the end. I’ve never tried Yoga before and I’m not sure my body knew it could bend in those directions. 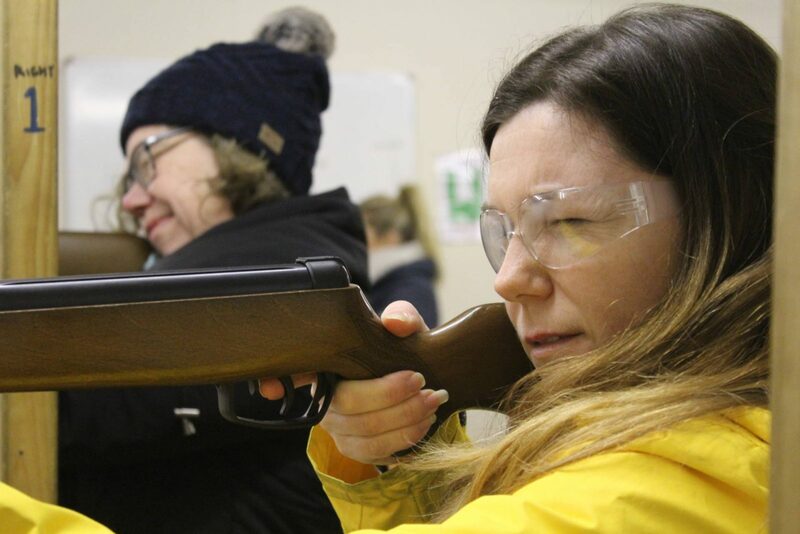 I wouldn’t say I’d learnt a new skill as such but I would definitely go again, I felt revitalised and slept so well that evening. The Yoga Lounge is easily located, with plenty of free off road parking. The building has a great energy as soon as you walk in you are greeted by happy, smiley staff who were quick to alleviate any nerves and answer my millions of questions. Like why does the room need to be hot? The room temperature heats your body from the inside out, which helps with relaxation, cardio workout and of course makes you sweat a lot. Ensure you drink plenty of water before, during and after. March 28th 2018 I gave flower arranging a bit of a whirl! Massive thank you to Edwards Flowers for hosting. Vicky was really supportive and I think I found a hidden talent. Not only do flowers smell amazing, but they are really easy to work with. The perfectionist in me actually liked the fact that there was no right or wrong way, everyone’s creations were unique but looked incredible. 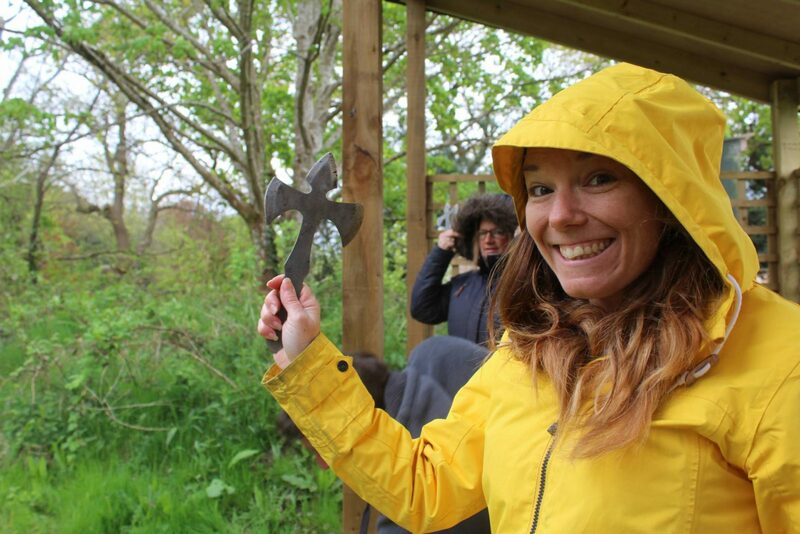 April 30th 2018 Tomahawk Throwing, again not one I will be adding to my list of skills but I gave it a a go! You’d be surprised how much “skill” is actually needed to throw an axe! Here’s me posing with an angel which was even harder to hit the target with! 16th May 2018 I remember loving pottery classes at school. I also remember making loads of things which “apparently” all ended up in that one moving box from Tokyo to UK that got lost. That one box, how on earth did that happen! I think though my adult insecurities took over and I found this activity really hard as I couldn’t relax and get into it at all. I was super impatient and found it hard to visualise the colours once it had been fired! But here is my after and before pot, what do you think? Did I succeed in learning a new skill? Before and after. @charliemoos great dish. 33. Get a new Tattoo : I’ve wanted one for years but keep putting it off because I need to lose weight I’m a scaredy cat! 34. Got to see World Strongest Man : This is my guilty pleasure. I absolutely adore WSM. I watch it every Christmas/New Year for as long as I can remember. I’d love to go see the Giants live. 35. Go on a Barista Course : We drink a lot of coffee, too much really! So it would be nice to learn how to make coffee properly or even do a latte milk course and make lush looking cups! 36. 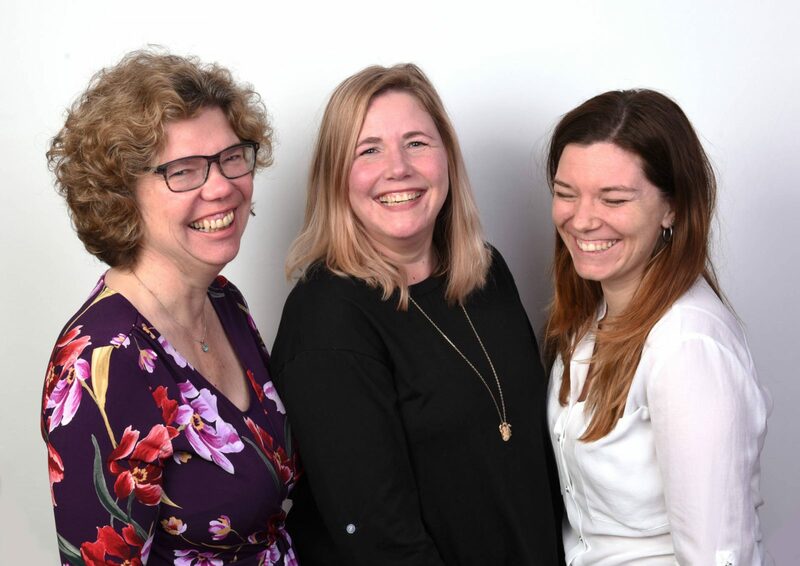 Do Something for Charity : 15th January 2018 I organised a head shot session with DK Capture for the networking group I co-host Lemur Linkup, which was obviously hilarious! We raised £50 for Julia’s House Children’s Hospice. 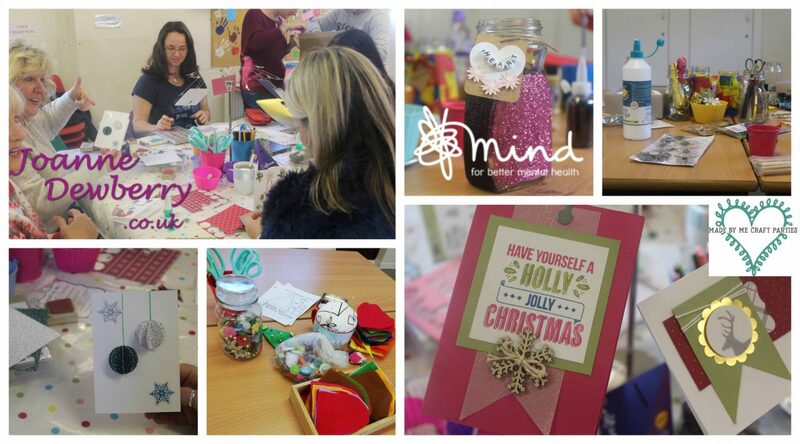 Crafternoon Mind 30th November 2018 : Ekkk I forgot how nerve wracking organising an event like this can be! After weeks of collecting craft supplies all of which had been kindly donated, selling raffle tickets, organising prizes AND putting up posters it was finally time to cross my fingers and hope people turned up. We had 14 crafters in all and the lovely Lexy from Made By Me Craft Parties who kindly ran the card making table, whilst my mother in law kindly supplied the much needed refreshments, I don’t think the kettle stopped! I could have done with organising an event photographer too, so many photo opportunities I missed out on! It was such a lovely afternoon, although I was so busy chatting I didn’t even get a chance to make anything! Luckily, there was A LOT of left over craft supplies! After the girls raided the box, we donated all the crepe paper to Olive’s school, the rest we sold on for donations and I can now confirm that everything is gone (OK I lie there’s still 200 odd stone hearts ) I rounded the donations up to the nearest pound making the total raised £111 thank you everyone who supported with money, raffle prizes, cake and your time. Massive thank you also to West Moors Guide Hall who waived the room hire fee. 37. Wikipedia Page : I’d love to have my own Wikipedia Page! Imagine that when someone searches my name! Having a Wikipedia page would make me a big deal 😉 I’m not sure of the ins and outs of this one so this might be a 2020 thing too! 38. 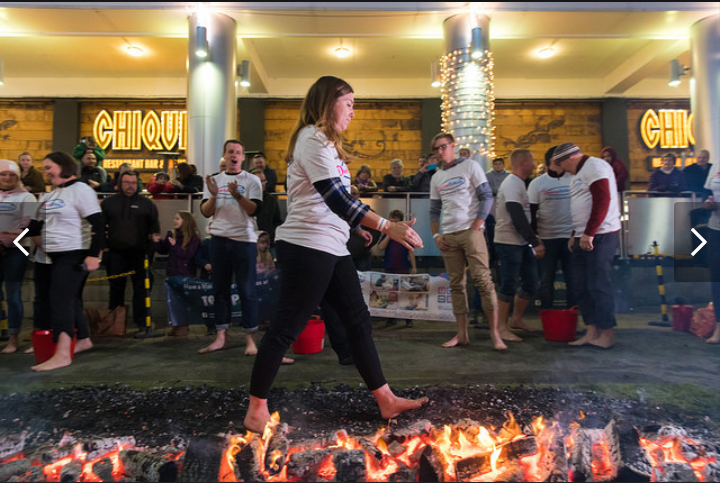 Walk on FIRE  : 17th November 2018 Since I added this to my list (although Daddy Moo suggested Fire Eating! this is my tamer version!) local event were popping up all over the place! 40. Have a big 40th birthday party! I’m really looking forward to the challenges, learning new skills and spending time with special people in my life. If you are a brand, charity or small business that is able to help me achieve my list in anyway then please do let me know. Thank you so much for all your continued #40before40 support! This post contains affiliate links helping me to fund 3 years of madness! Next Post Traditional Vs Digital Branding: What Is Best For Your Brand? What a fabulous list! I love birthday goals. So many to talk about – Eat an Eel?? Eew! I love WSM too & to get a blue Twitter tick is a brilliant goal. Fingers crossed I can achieve them all! I dont realize either how time has flown and i have crossed 30. Just like you i feel i am in my 20s or even not an adult!! Thank you! I’m really excited about doing them! I’m 54 this year but make a chicken pie is still on my list! Birds Eye make it too easy. Seriously my advice would be not to get hung up on bucket lists. Enjoy each day. Yep, I’m one of those people who also want to go to the Blue Lagoon. Loads of luck with book 2 and 3, you’ve got this! Haha! I shall bear that in mind! I have just turned 33 and would love to do a 40 before 40. Cant think of 40 things just yet. I have your book!!!! brilliant and really helpful. But can I ask why you would want to eat an eel? Great list – I need to do a 60 before 60 though! Wow, realised as I wrote that how that’s my next milestone! Woah! What a great list. Your detemination to finish off the list is so inspiring. And SUPing is dope! By the way, you look nothing like going on to 40. Thank you lovely! Still a fair few to go!